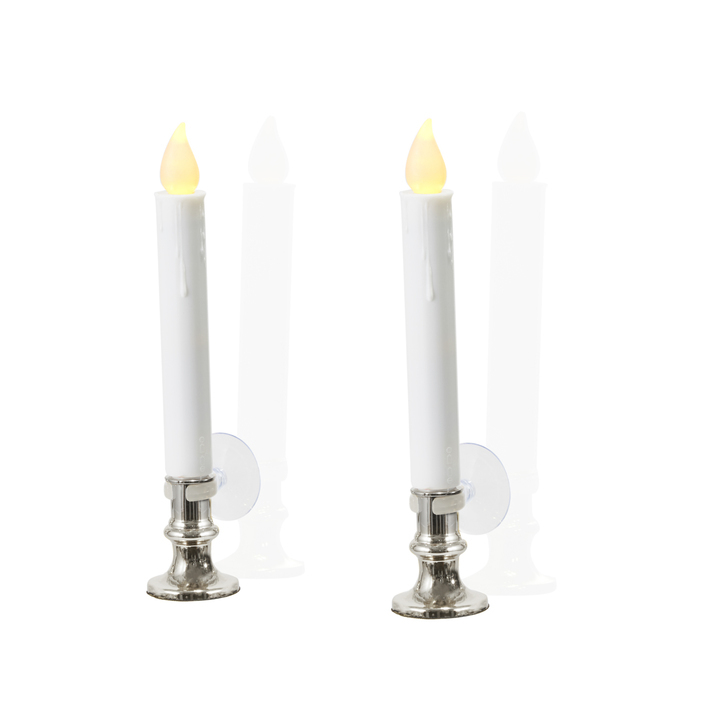 There are only 480 available of the White 7" Flameless Resin Taper Candles with Removable Silver Bases, Set of 8. Your selected quantity has been adjusted. 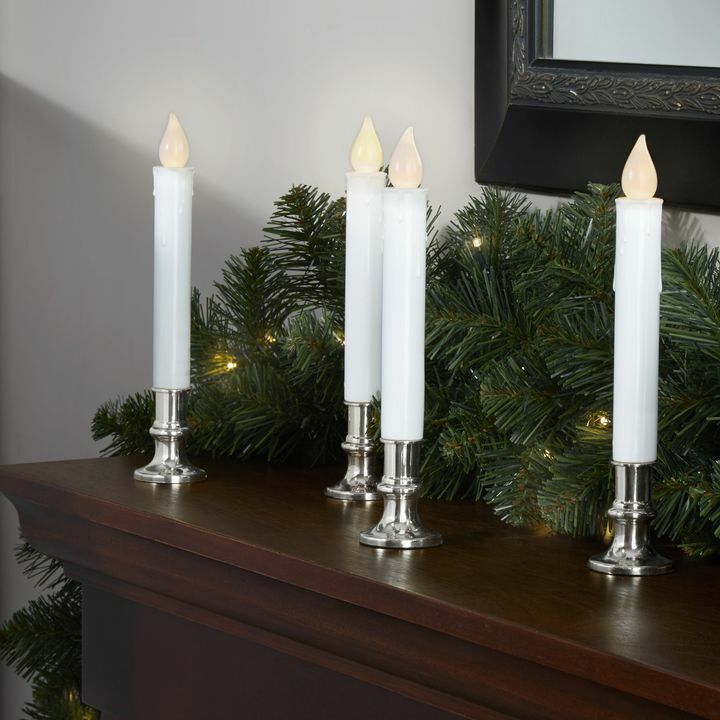 With their life-like drip effect, classic, removable silver bases, and inviting glow, this set eight of flameless taper candles will add festive ambiance to any holiday display or window sill without the mess of wax drippings or worry of open flame. Each taper activates with the simple switch at the bottom and remains on for five hours. Includes a remote for ambiance modification at a distance. Perfect for home, weddings, churches, restaurants, and events. While I have only had the candles set up for a couple weeks, we are already enjoying them. They are a little softer glow than the ones we had previously, but the fact that I do not have to have electrical cords hanging from the old candles in the windows and multiple extension cords around the rooms, greatly out weighs the softer glow of the candles. I am anxious to see the "life" of the candles but my initial assessment of the product is positive. I recently purchased a set of 8 window candles to replace the candles i have had for 10 plus years. These candles came with a remote to set a timer and they are very bright. I would highly recommend them. For many years now i have had candles in my windows all year round, so i am happy with this updated replacement. Love these lights. Have them in each window. Love how they flicker ! Used them for the whole season, while the included batteries aren't as strong as the AA's I have lying around, they did a great job keeping our windows festively lit this winter. The lights are easy to set up and the remote makes it a breeze to turn them on and off and change the type of light (steady/flickering). Researched these type candles on Amazon and others and found these exact ones to be the best price, value, use, and look. Very pleased. These lights look great and are easy to use. We have them set to come on for 8 hours at 4p each night. The house looks festive even when we are away overnight. I highly recommend them. Product is as advertised! Good strong light effect and love the various settings. I plan to leave them out all year! Love them Need to order another set! Battery operated and soft white light. Love the options: 4 hour or 8 hour timer, Steady or flicker. Only giving 4 stars as every so often one candle will change from steady to flicker but I have no idea why and it will happen to various ones at different times which throws off them all turning on at the same time. Still enjoy the ease and convenience. I purchased the window candle set of eight a week ago and they are exactly what I was looking or. well made and functionally what I wanted. Of the 16 candles that I purchased only two are a little janky with regards to automatically turning on and off. Otherwise, these were one of the best purchases that IвЂ™ve ever made. So long cords and off-center candles! Best candles that IвЂ™ve found...love the remote and the capability of setting a time limit! Quality product! Remember when you had to find a wall socket for each and every candle you wanted to put in a window! Well, no more. Open the box, install the batteries included, turn on the switch and set them in the window. Done! Aim the remote and set them your way! When it's dark outside, go out and look back at the candles in the window and see how beautiful they look. I have mine set on flicker and the neighbors on the next farm could not only see them, but could see they were flickering as well. My only complaint is that they don't seem to sell a replacement flame tip if the light ever stops working. So it seems if the light burns out you have to throw the whole thing away and buy new. That's not very eco-friendly. Otherwise I would have given 5 stars. Wanted battery powered window lights that were on a timer but didnвЂ™t break the bank. These lights are perfect! They are the perfect brightness and very attractive from the street. Bonus that the suction cups and batteries came with it. 1 light didnвЂ™t work but I emailed the company and had a replacement in the mail just days later. Thanks for a great product and excellent customer service! Would definitely buy again! Love these candles. After 15 years of fighting with cords and timers, I finally upgraded. Worth every penny. Love the remotes and timer options! Set and forget! I love these lights! They work perfectly. I am going to order another set. Product was as good as advertised. Excellent remote. Due to lateness of arrival, the customer rep was kind enough to remove 15% restocking fee. Excellent service!! So happy with the purchase of these candles! I had been searching for a long time for battery operated warm light candles. 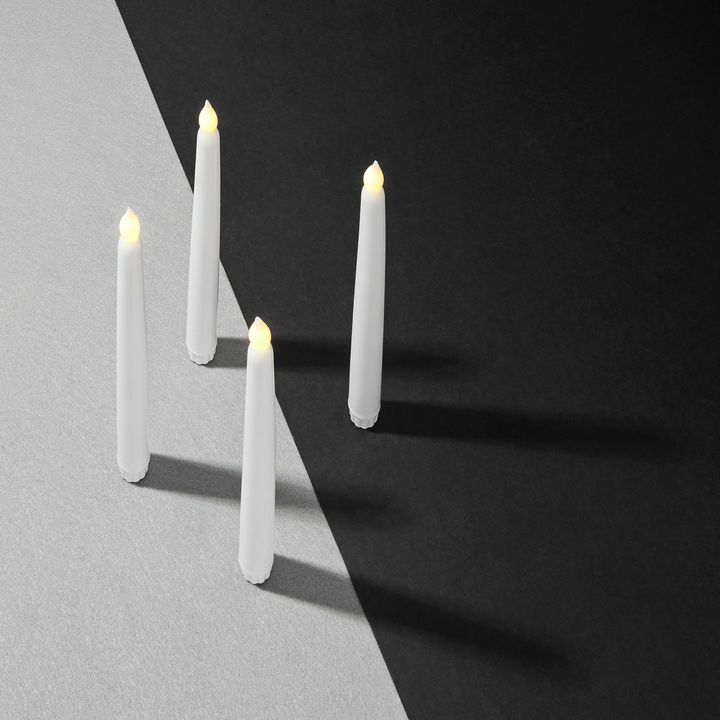 Most window candles on the market are too bright and harsh. These are soft, warm and reminiscent of candles from my childhood. They look lovely on the window sills. They are easy to light with a nice little remote that has several features. These candles look perfect in my windows. Just what I was looking for! One of the 8 cadle lights I purchased did not work. I contacted lights.com and it was replaced in less than a week . I am very happy with their quick response. Great product, well worth the price. HavenвЂ™t had them for but a week, but impressed by the overall quality so far. I didnвЂ™t give 5-stars bc IвЂ™ve noticed that the slightest jostle will either turn the candle on (or) off when the candle is in the on position...tough to describe but if the candle is on вЂњtimer modeвЂќ and is jostled (ie by my cat) while technically unlit, the commotion will actually turn it on...and vice versa if technically lit, the commotion will turn it off. Very affordable and I love the timer. Once you set it for 8 hours, they come back on the next day at the same time automatically! prompt shipping. product priced on the high side of reasonable. just receive my lights and they are perfect for my window sill. Love the glow. Thank you. I love the remote feature on the candles along with the timer. Thanks! I have tried other flameless candles for my windows and never found anything that looked and worked well until I ordered these. They are absolutely perfect. They look great and work well. These candles are just what IвЂ™ve been searching for. I ordered two boxes (a total of 16) to use for Christmas lights in my windows and every one arrived in perfect condition. I love that the batteries are already included - that saves me the time and money of getting them myself. The color of the light is exactly the same as a real candle I have burning at this very moment. The flicker is very subtle and doesnвЂ™t make you dizzy if youвЂ™re sitting next to it. The light has been bright and consistent for over a week now. I set the 8-hour timer to come on at dusk and they turn off automatically sometime in the night before turning on again the next evening. So much better quality than all the other brands IвЂ™ve tried that fall dim within a few days and you spend a fortune replacing the batteries. Highly recommend!! Very easy to use and beautiful. The lighted "candles" I bought work perfectly, and turn on and off automatically as programmed. They were an excellent value, and I am very pleased with them. Exactly what I wanted! Love the timer/ remote control. They look beautiful from the outside. I have only had these a few days but so far I love them. They are easy to set up and I love the remotes, timers, and that they come with the batteries. 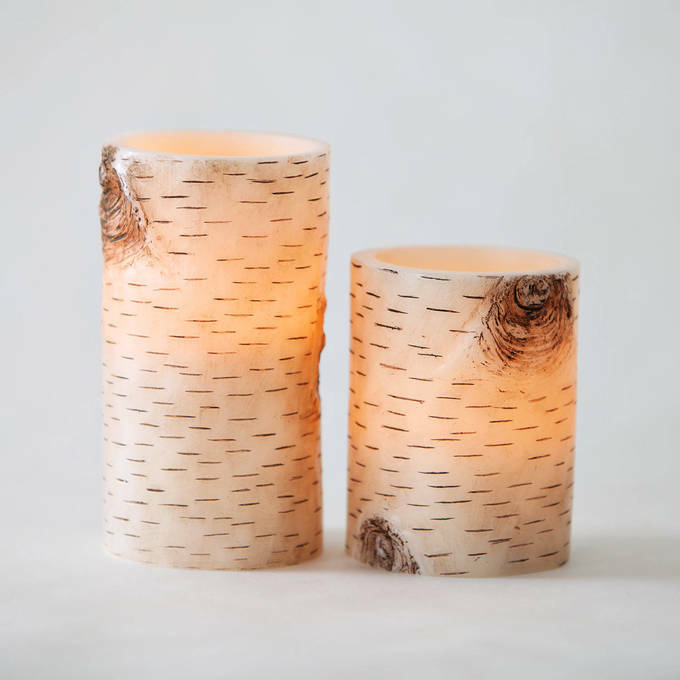 Absolutely everything about these candles are amazing. The look, the price and that remote is the best......and they even give you the batteries!! So happy I found this site!!!! These candles are extremely easy to use. I am very happy with my Christmas window candles. I especially like the remote control feature.I will definitely purchase from this company again. Customer service and support is excellent. 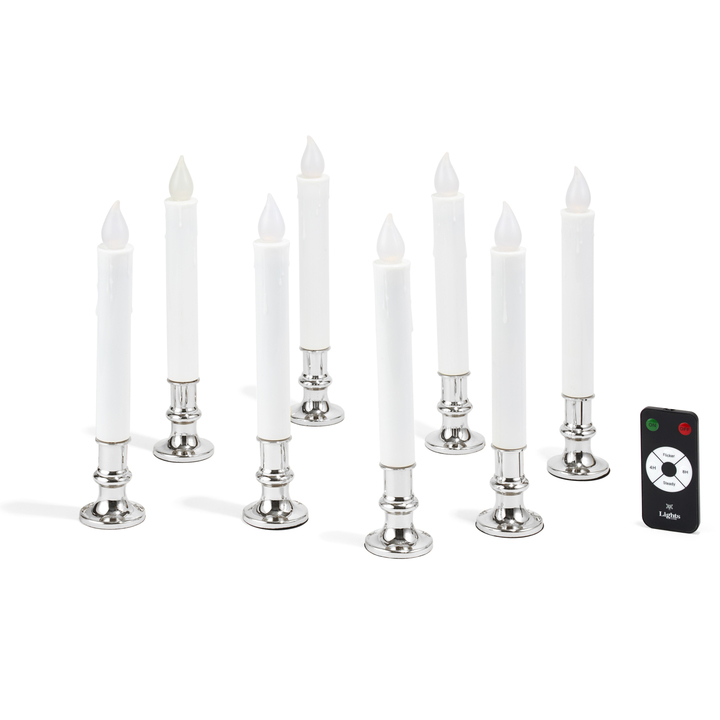 Taper candles with remote. Great quality for the price. Used as Christmas decorations. Look beautiful! Love them--especially the remote control! And appreciate that batteries were included. These are beautiful lights in my windows! Love having a remote control with various lighting options. Packaged well and received item quickly. I've tried much cheaper versions of window lights and you get what you pay for. Based on the visual quality of these - I expect to be able to use them for many years to come! The light they give off is what I was hoping for (not cold like most LEDs). The silver bases are very cheap plastic, but I was happy to discover they come with suction cups to hold the candles against my windows. One of the 8 lights will not respond to the remote. I plan to call to try to get a replacement for that one. Got these for my parents and they love them! They make Christmas decorating so much easier. Glad I was able to please them as my mom was unsure of battery operated candles since she had tried to use them before and was left unhappy and going back to plug in ones. This year I can say we changed her mind. One of eight is not working consistently. About to contact company. I absolutely love that they don't have cords and that they turn on/off with timers! So much better than the old ones I used! Candles look great in the window for the holiday. I ordered 2 boxes and 2 out of the 16 didnвЂ™t work. Not sure what to do to get them working as they are getting power, they just wonвЂ™t stay on; they just flash whenever you hit a button on the remote. A little frustrating given the price. Wow, how things have changed! Waited decades for candles that would work on the sill-less windows in our 18th c. house, and these exceed all expectations. Not only can they be attached directly to the window, theyвЂ™re nothing like the candles of my childhood. They actually look like real candleflame; the perfect color, brightness and even the option of a subtle flickering effect. No cords! A remote on/off! I couldnвЂ™t be happier. On spot. These lights worked wonderfully! I like them. A little expensive, but they are just what I wanted. I fell in love with the lights as soon as I opened the box, easy to assemble and they look real from afar with the flickering light. However, one of the candles did not want to turn on at all, and another 3 donвЂ™t respond to the remote (have to manually turn on/off). I called customer service, and they are willing to send replacements but I have to wait another 2 weeks or so for shipment when itвЂ™s not even my fault theyвЂ™re not working. They canвЂ™t do a rush because itвЂ™s just a вЂњreplacement.вЂќ So obviously I wonвЂ™t have them on time for the holidays. The original shipment took almost 2 weeks to arrive. Everything I looked for in a window candle! Included batteries a real bonus! I love them. Warm flickering lights add the perfect touch to my holiday decor. Simply elegant. Love the remote control/timer function. Overall I am happy with the quality and look of my new window lights. I ordered 3 boxes or 24 candles. Two didnвЂ™t work at all and two have switches that donвЂ™t work. I can operate them by tightening the bulb however. I have not tried using the remotes yet. Love these lights. They all worked perfectly and were exactly as advertised. The lights are bright and look great from the outside. So convenient as they turn themselves on and off. Exactly what I was looking for. Candles come with batteries and suction cup mounts. The saying of вЂњYou get what you pay forвЂќ resonates with me on this purchase. While these window lights maybe a little pricier than what youвЂ™d pay at a craft store or discount chain they are AWESOME!!! Quality construction, equipped with batteries and a remote control that you can program based on your preferences, I honestly canвЂ™t say enough about these lights! The prior reviews were absolutely on point! Thank you Lights.com! Look perfect in the windows of my home. The soft yellow light looks like a real cable. The remote is convenient and much easier to control lights than needing to individually turn them on and off. The automatic feature is about 90% effective. Of the 14 candles that I have displayed, one or two do not come on automatically or shut off as programmed and need to be reset. Even with that inconvenience, I would purchase them again. These candles are the best I have had. They come well packaged ready to go with batteries. The remote timer allows for easy set up. I chose on for 8 hours. The light is very elegant. I would recommend these! I've ordered from Lights.com twice and have had wonderful results each time. I ordered the flameless timed pillars and they are beautiful, work perfectly and customer service has been very helpful when I called. On my first order, I had one light that would not work, I called and Lights.com shipped a new replacement right away. I've recommended Lights.com to friends and they have made purchases also with great staifaction as well. Thank you Lights.com! I have been looking for candles like this for a couple of years to sit on my windowsill. The lights look beautiful from outside. I have been looking for candles for our r windows. These are a great size battery operated with a timer. Perfect. the candle light flickers and it is not to bright. I love the light color. They are not that blue white led color that I hate! Nice quality. Would buy again! These candles are just what I was looking for. I do not have outlets at my windows and these are perfect to light up the windows for just a few hours. I bought these to put in my windows and on some shelving for the holidays. I wanted to do away with all the cords traditional ones require. The look and work great. I did have two that I had issues with but they replaced them for me. They are exactly what I was looking for. These candles are great! Very user friendly. Buying another set for my parents! Great for homes where each window doesn't have an outlet for the traditional candle. I liked the candles but did not like the choice of 4 or 8 hours for the timer. Prefer 6 hours. It took me 3 days trying to get the timers set up correctly, due to unclear instructions. I purchased 3 sets of 8 lights for the windows in my home for Christmas and the lights are great! They are bright, well made, and can be seen from the street. The remotes are an added bonus and work perfectly making it so easy to turn each candle off & on. I will use these each year until I need to replace them and I hope Lights.com will continue carrying these. They are a good buy and wonderful investment. Thank you Lights.com for carrying a long-lasting, sturdy & beautiful candle! These candles are as advertised...soft white light with flicker or solid on setting and the ability to brighten or dim and and set for auto on/off at 4 and 8 hour intervals. All are working just fine although one or two sometimes forget their setting. These are not bright white like incandescent but have a lovely soft white candle glow and their ease of makes them a snap to put out for holiday decor. They are an excellent product for their price point. This is a good product for the price. Unit works as advertised. We wanted to put candles in our windows for the holiday season. You can see them clearly from the street (about 30 feet away in our case) and they are very simple to put together. The remote needs to be about 4-6 inches away from the candle to work (which is a good thing). I've heard others complain about them not working when putting them together and here's what i found. The connecting plate at the top of the bulb does not make consistent contact with the leeds from the battery. So in the case of one of my candles, I had to stick my finger into the candle housing and pull gently upwards on the metal connector wire inside. It's a slight design flaw but the candle works perfectly after. I hesitate writing this review . . . simply because I really LOVE these lights! My sweetie (actually husband) and I enjoy the remote control aspect. We have currently been using the flicker candle mode with the remote turn-on turn-off feature; however, there is also a timer feature which we intend to use after the holidays. -Note to Lights.com: Please don't increase your great prices! I'm very happy -- arrived on time and was well-packed. I ordered 5 sets and all 40 lights are working. The batteries (included) go in from the top by unscrewing the bulb and it's seating, despite the directions showing the bulb entering the candle tube from below. Some of my lights were shipped w the tiny switch (located beneath the candle tube -- pull off base) in the "off" position, check that first. One light gave me trouble but got the battery contact to work in a partially screwed in position. The flame color is soft yellow w just a hint of orange, close to a real flame. Easily seen from outside too! Lights work great! Wish there were more instructions on how to set the timers. Love them.....they look great in my windows....the flame looks so nice. These are exactly what I was looking for when replacing our old plug in candles. The best feature, as the previous review states, is that they will automatically turn on at the same time the next day, so no need to turn them On and set time every day. These are great! Replaced our 'plug-ins' with these. The multiple settings and remote control are a great feature. Will probably get more. I love all the lights... so romantic and great with those dark winter days. The ones with the remote are fantastic. I'm going to order more with the double A batteries because it last longer. candles were individually packed and came with batteries. I have the lights at my house in the mountains and I just have to figure out how to set them for 8 hours. they are beautiful. Great service and good buy. The light can in a timely fashion and the remote timer works great. Yet 1 of the lights will not work. I purchased to place in the front windows of my home. Will be reaching out to the company. Great deal, Great look, Great price. Great turn around. Ordered on Friday and had them Monday. These are accent lights not a light source and work well for that. I put them in wall sconces in the corners of a room so the remote is a great feature. No real difference between the dim and bright function and the candle flicker effect not very convincing but left in the bright setting looks good. Received very quickly..can't wait to use for Christmas holidays is Windows!! I'm very happy with these candles. They worked right out of the box, and the options are great: the remote turns the candles off and on, adjusts the brightness, selects flickering or still, and selects a 4- or 8-hour timer that *WILL come back on the next night at the same time* every night! I discovered it's best to line the candles up on a table, experiment with the remote, choose the timer function if you like and then put them in the windows, because if the candles are too far apart, the remote won't catch all of them in one click. The remote is easily blocked, too -- it won't go "through" one candle to another. But if you don't mind operating each room separately and don't want to use the timer, then if you hurry you can probably get all the windows lit up in fairly quick succession. For our house, though, it's going to work great with setting the timer and *then* arranging the candles for the season -- set and forget (and hope the batteries last all season). The candlelight color is not quite as white as a traditional electric candle bulb, but it's pretty close -- not amber, thankfully, and not warm white, but right in between. Not fake-looking at all. Also not quite as bright as a traditional electric candle, but again very close. The flicker function is slow enough that it's not weird-looking, but I'll probably keep the still function on. I have sheer curtains in two of my windows. Are these bulbs cool enough to be placed with sheer curtains behind them or near or next to them? 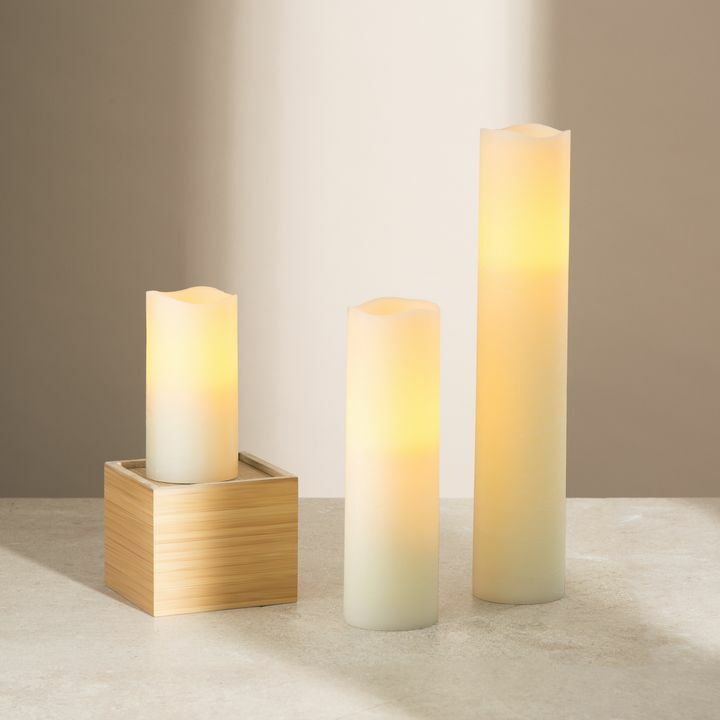 The White 7" Flameless Resin Taper Candles with removable bases use LEDs to light up, so they don't give off any heat. They're the perfect window candles. Do you have to set the 4 hour timer every night or do you set it just once and they will keep coming on night after night ? 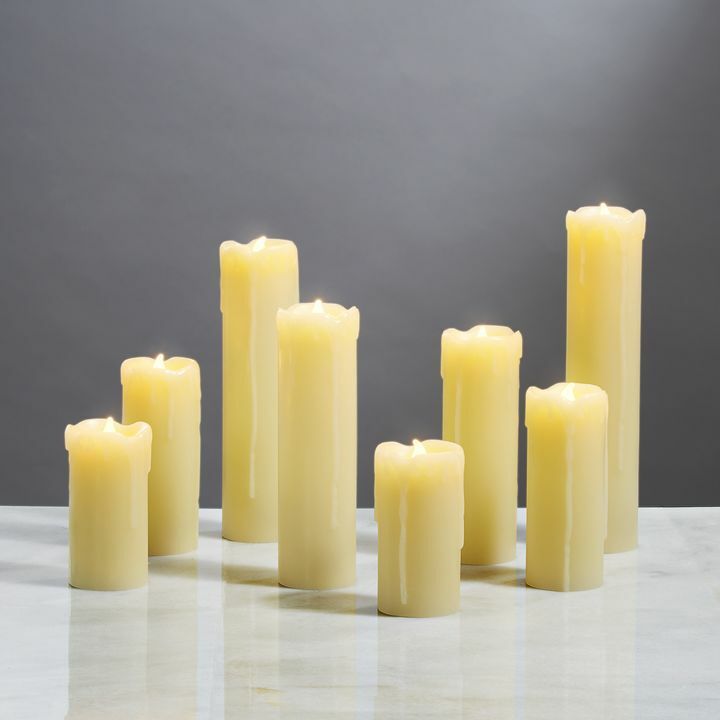 For the White 7" Flameless Resin Taper Candles with Removable Silver Bases, Set of 8 you set the timer once and it turns on the same time every night. Is the silver base plastic or metal? For the timer, I understand you need to click the timer at the time you want them to go on. Is it true that it doesn't start on the first day? I set up the candles and clicked the 8 hour timer and they did not switch on. Do I have to wait for tomorrow for them to come on? The White 7" Flameless Resin Taper Candles with Removable Silver Bases, Set of 8 needs the timer to be set on that day. You must first gather the candles and turn them manually. Then press the green On button, followed by pressing the timer button of choice. Will the remote turn on all the candles at once if they are on different floors? How far away does the remote work? One remote will turn on all White 7" Flameless Resin Taper Candles with Removable Silver Bases. Do these lights have an option for a steady light as well as a flicker light? The White 7" Flameless Resin Taper Candles with Removable Silver Bases, Set of 8 have a steady on and a flicker option. How do I set the timer for the white taper candles to go on at the same time every night? 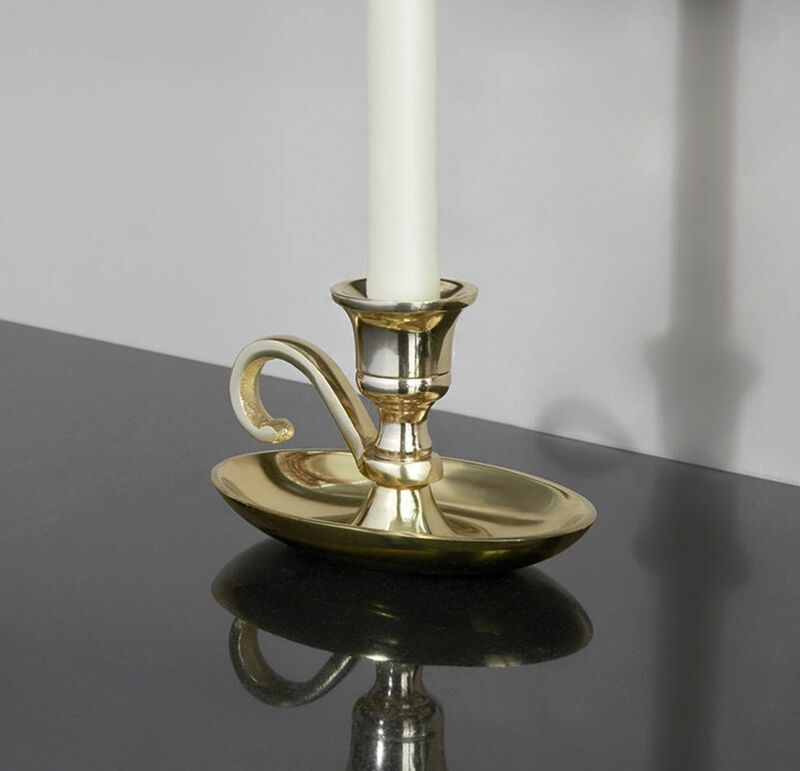 To set the timer for the White 7" Flameless Resin Taper Candles with Removable Gold Bases, you must first turn the candle on from the bottom. Then press the green ON button and the then press the timer button. I lost the remote for the candles and they only function in always on / always off now. Is there any way to get a replacement remote or the IR codes to setup a universal remote / Harmony remote? Thank you! I ordered these from Amazon and really like them. However, one doesn't respond at all to the remote. Is there anyway to fix it? we do recommend using the White 7" Flameless Resin Taper Candles with Removable Silver Bases, Set of 8, outdoors since they are not weatherproof. I have a set of these and my dog chewed the remote. Can a remote be ordered separately? How tall are these candles? 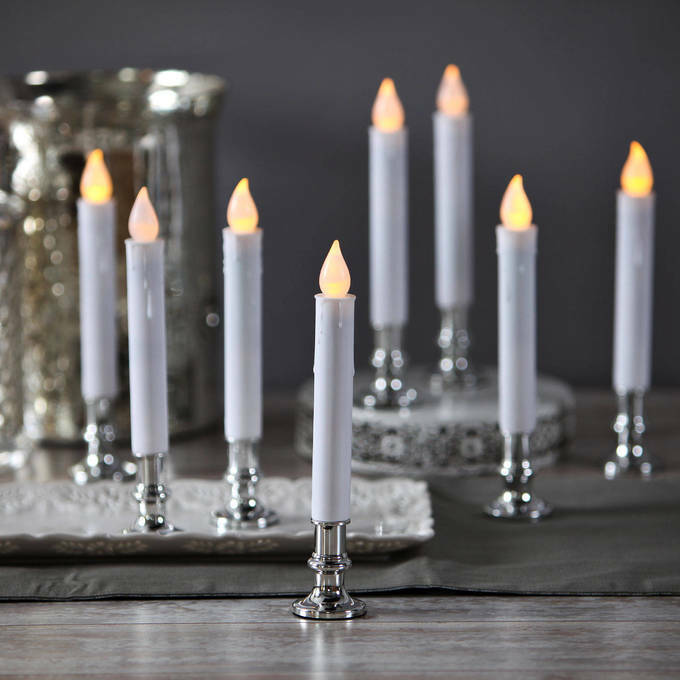 The White Taper Candles with Removable Silver Base are 7 inches in height with a 2.5-inch silver base. 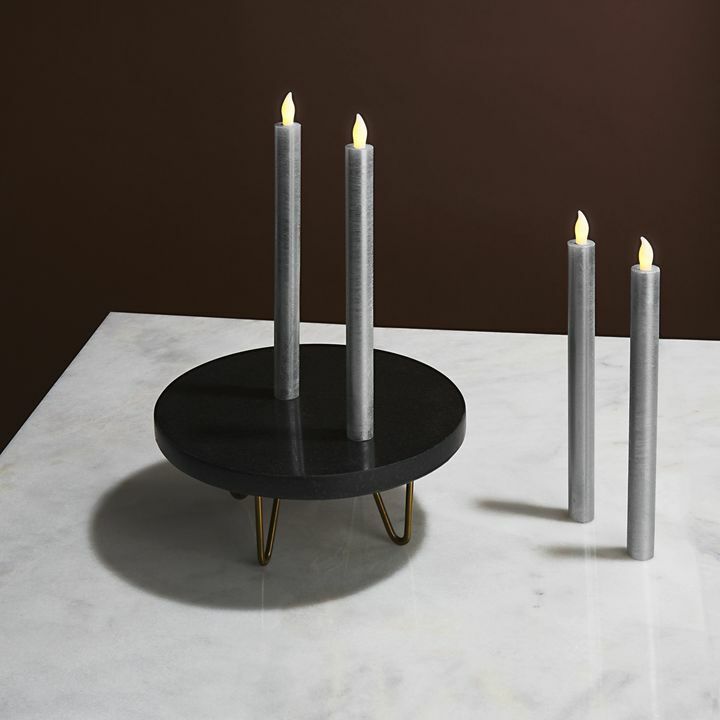 Therefore, the candles including the silver base are 9.5 inches tall. I'm repurposing an old chandelier above a table on my front porch. It is not powered, so I thought these would work great in the holders (once we remove all the electrical parts). Question -will they all come on at the same time with the remote? Or do you have to point them close to each one individually? Once the on/off switch on the candles are ON, the candles are able to sensor the remote. The remote will be able to turn all the candles on at the same time as long as you are at least 4 feet or less close to the candles. Hi, I really like the capabilities these candles have. The batteries though only last 120 hours? Doesn't seem like a long time at all. I've seen others that last a lot longer. Any recommendations on what batteries are best to use with these? Thanks. These candles use AA batteries which last at least 180 hours. We recommend for you to use rechargeable AA batteries. The higher the MAH the longer the battery itself will last. 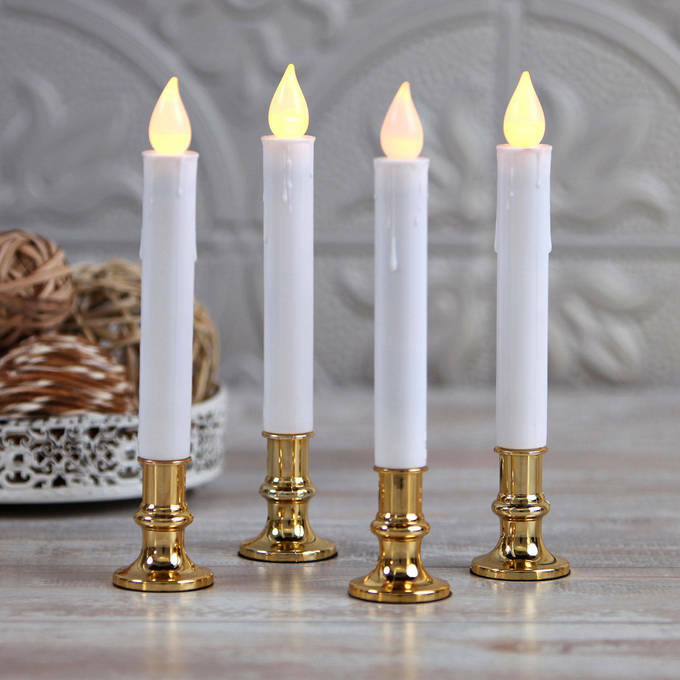 Hello, The candle stick's diameter is just under an inch, and the bottom that is inserted into the base is just under 3/4 of an inch in diameter. The base that comes with the candles is removable. I received a set of 8 tapers as a gift and was looking forward to using them. I have put batteries in the candles and tried to turn them on. The instructions only say to "Turn candle switch to ON and select the timer of your choosing and hold the button until the flame flickers." I have tried 3 candles, even flipped the ONOFF switch in case it was in the wrong position. I tried pressing the 4hr button first, then holding the ON button. I have tried pressing the 8 hr button then holding the ON button. So far I tried 3 candles, holding the ON button for as long as 30 seconds, but none of the candles come on. I even tried holding the hr button for awhile. What should I do next? Sounds like you haven't removed the tab that protects the batteries. Turning them on should just be a matter of pulling the tab protecting the batteries, once removed and switched to the on position underneath the candle they should turn right on and can be controlled with the remote from there. If the candles are still not turning on, we recommend for you to swap the batteries from the ones that work into the ones that appear to not work. If you are still experiencing issues, please email us at 866.490.9358 and we'll be happy to proceed with a replacement order if it did not pass our 90-day warranty policy. 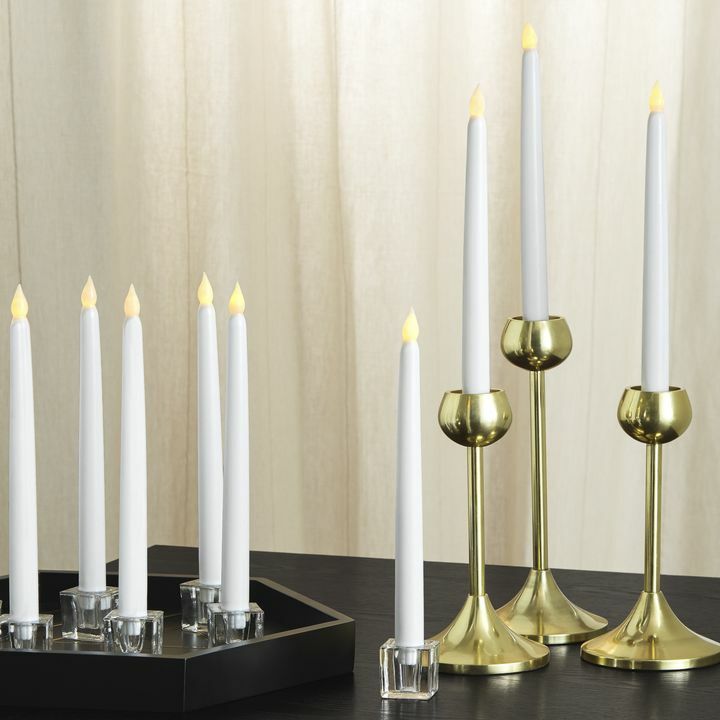 Re: Ivory Taper Candle with Removable Gold Base, Set of 8 with Remote Manufacturer's Model: LC003448 What is the color of the flame? Different customers seem to have a different idea of the color. Thanks. The LED light from the candles is warm white with the LED temperature of 2700k. Candles with 2200k-2400k are usually an amber color. The LED temperature for these candles is higher so they are closer to white, which is a yellowish color. I have read a review on Amazon that said "If you order the candles with a gold base the flame color will be orange. If you order the silver base the flame color will be a natural light amber color much like a real candle. Is this true? Thanks. They're all manufactured the same way. The LED temperature for these candles is 2700k which are closer to yellowish. Candles with LED temperature of 2200k-2400k tends to emit orange-amber color. Since there are no replacement bulbs, what is the life expectancy of the bulb and what do you do when it dies? These candles use AA batteries. AA batteries usually last at least 180 hours. You can replace the batteries once the batteries die. 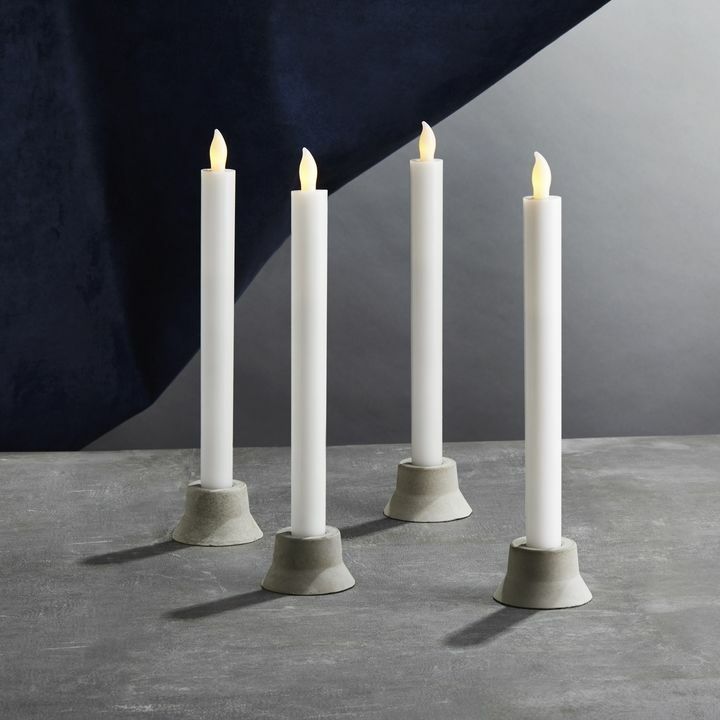 What is the expected battery life of these candles? These candles use AA batteries. They usually last at least 180 hours. Re: "Ivory Taper Candle with Removable Gold Base, Set of 8 with Remote", how much for 1 more Candle? I'm a Jew and would like to order the set plus 1 more before Chanukah? Secondly, if I order this Friday will I get it BEFORE December 1? If ordered this Friday you can have it by the following Friday at the latest. Once you receive your purchase just call us at 866-490-9358 with your order # and we'll assist you with the additional candle. I am comparing the set of 8 (w/ remote) against the set of 4 (w/out the remote). I currently own the set of 4 and am hoping to find something a little brighter. The set of 8 allows you to adjust the brightness. Can you please tell me how the set of 8's brightest light compares with the basic set of 4? Thank you! They both have the same amount of brightness, the only difference is that the set of 8 can be dimmed slightly. Are these candles also sold individual? I need 9 candies for my space. These candles are not sold individually. Will I be able to take the bases off and put these in another base? Can the bulb be replaced and is there an on/off switch other than the remote? No the bulb cannot be replaced and yes, under the candles there is the on/off switch. Hi, I'm looking into illuminating my dinner table by using12 flameless candles in a non-electrified toleware candelabra chandelier. Do you know the lumens level of a single flameless taper, or 12 tapers? Also, can the remote be used to control more than 8 candles? Thanks for your advice. We typically do not measure the brightness by lumens. These candles are decorative and won't be a good main source of light for a room. They are great for windows but you wound not be able to use for reading purposes. The remote is able to control as many sets of the same product. There are no instructions or battery positive/negative indicators for which way the batteries should be installed. Can someone tell me how to put the batteries in, like positive up or down & negative also? The positive side of the batteries goes in first. The negative side should always be in contact with the spring in order for the candles to turn on. We're looking for candles that can be used in a historic municipal building with 65 windows. The remote may be great, or might not work for our application bc of all the many rooms. Can the 4 or 8 hour timer option be set directly from the candle? Also, is there a difference in the flame color between the silver and gold base products? Thanks! The timer function can only be set with the remote. There is no difference in the flame color between the gold and silver base. They both have a warm white LED light. I am looking to replace some wireless automatic candles i bought years and years ago, but I can't seem to find the exact type. This looks exactly like mine except it says it has a white LED. Mine have a frosted glass "flame" but the light is obviously a reddish color. The picture of yours has a slight red tint to it. Does it actually or am I seeing things? Candles that have LED temperature of 2200k-2400k would emit an orange-amber color. These candles are 2700k which is closer to a yellowish color. Are there instructions for setting the candles up to come on the same time each night and stay on for 8 hours? These candles come with a remote that includes the 4 or 8-hour timer function. Once the candles are on the ON switch, you can select the 4 or 8-hour timer at the time you want them to turn back on the next following day. EX: If you want them to turn on every night at 8 pm, you need to click on either the 4 or 8-hour timer at 8 pm in order to set the candles at that time. 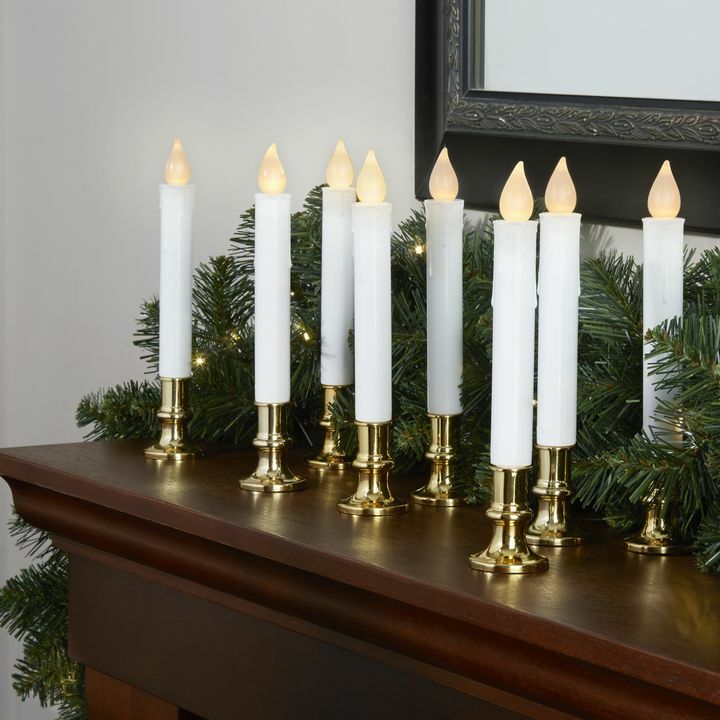 The way these look, flickering light, and adjustable brightness are ideal for what I'm looking for: however, I need candles that can be turned on and off, and have the brightness controlled, by the person holding it -for use by a choir. Would these work for that, or do you have a similar product that would? Thank you. These candles can be used for that purpose. But these candles are able to sense the remote at most, 4 feet distance. 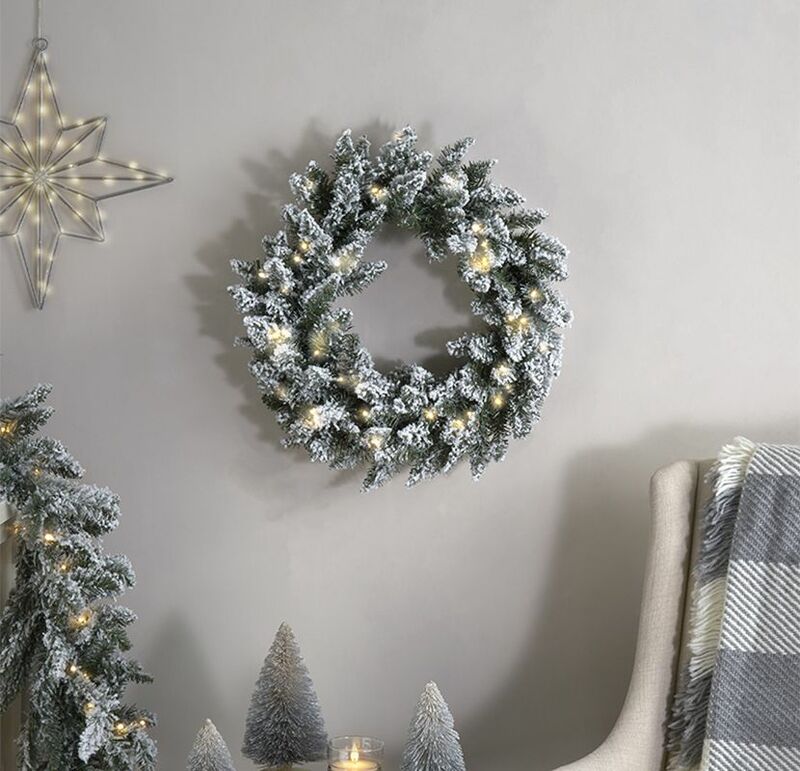 I'm looking for tapered candles with holders that have a very bright LED so when I put them in my windows for Christmas they will shine very bright. Is there any kind that you sell. The ones in department stores are not bright at all. These guys are used far and wide throughout the nation during holiday season with little to no complaint. We expect they'll suit you perfectly.